The Lady of the House jumped out of the van and took this photo for me. The Lady of the House and I started our epic road trip by camping outside of Flagstaff in a location we found courtesy of the Free Campsites website. We planned to visit the Meteor Crater National Landmark and Winslow the next day, so the location off I-40 was perfect for us. 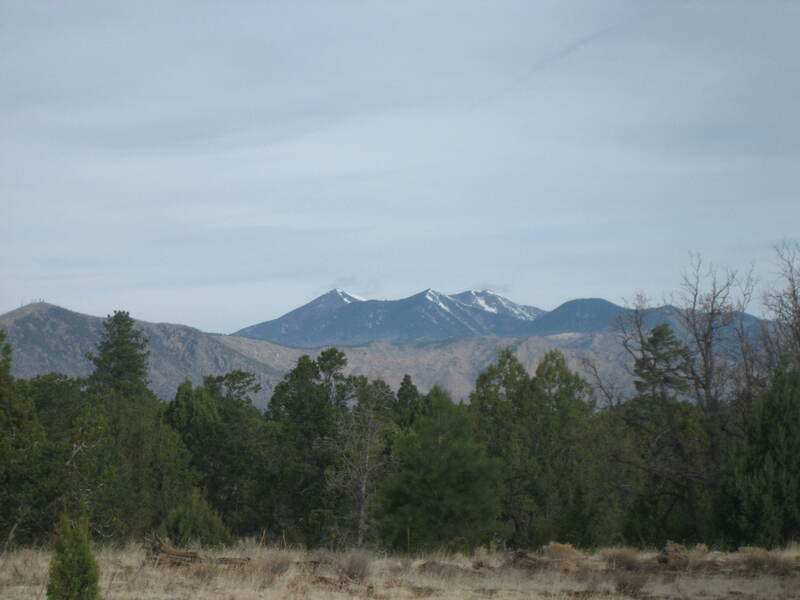 The free camping is in the Coconino National Forest right outside Walnut Canyon National Monument. Walnut Canyon National Monument (Hopi: Wupatupqa) is a United States National Monument…The canyon rim elevation is 6,690 ft (2,040 m); the canyon’s floor is 350 ft lower. A 0.9 mi (1.4 km) long loop trail descends 185 ft (56 m) into the canyon passing 25 cliff dwelling rooms constructed by the Sinagua, a pre-Columbian cultural group that lived in Walnut Canyon from about 1100 to 1250 CE. 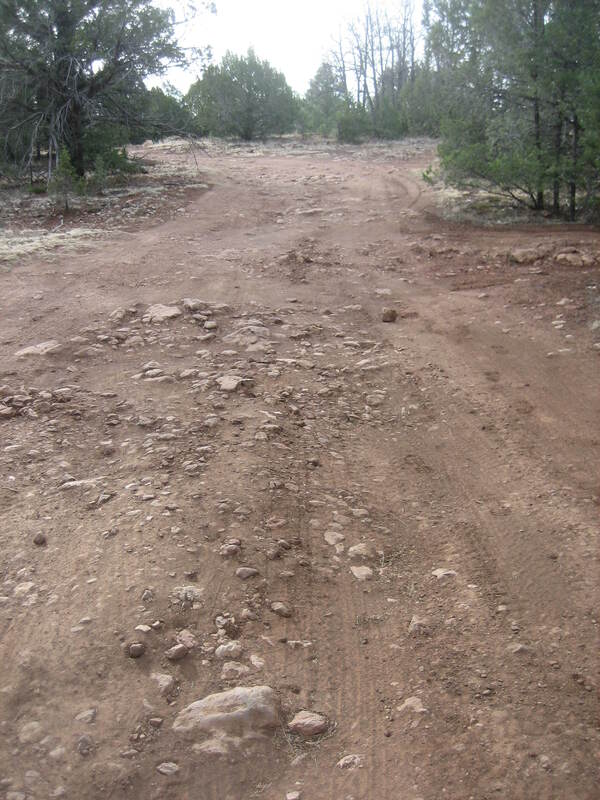 This photo shows the well-maintained dirt road into the boondocking area. I believe this is the road Google calls Oakmont Drive and says becomes Cosnino Road. From Interstate 40, we took exit 204 as directed by Google, then turned onto Walnut Canyon Road, which we followed to Cosnino Road. 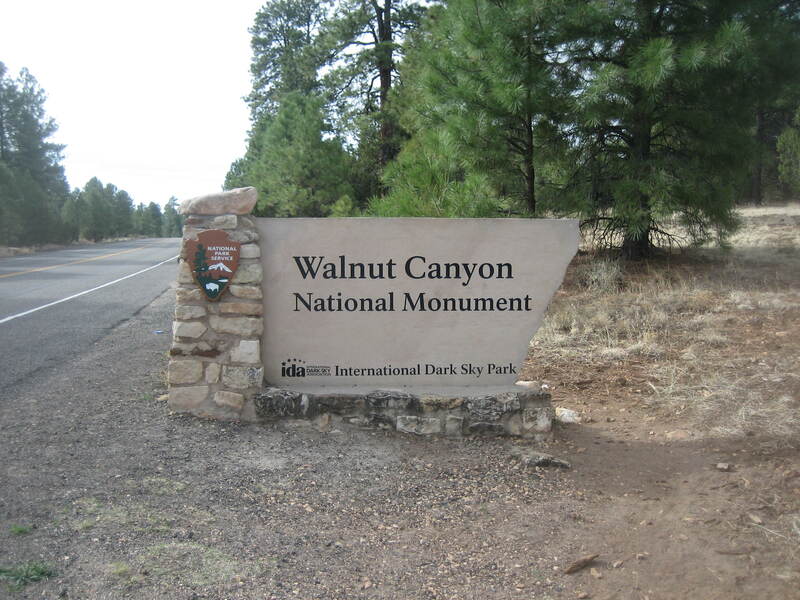 When we saw the Walnut Canyon National Monument sign, we knew we were close. We arrived before dark, so it was easy to see where we were going. 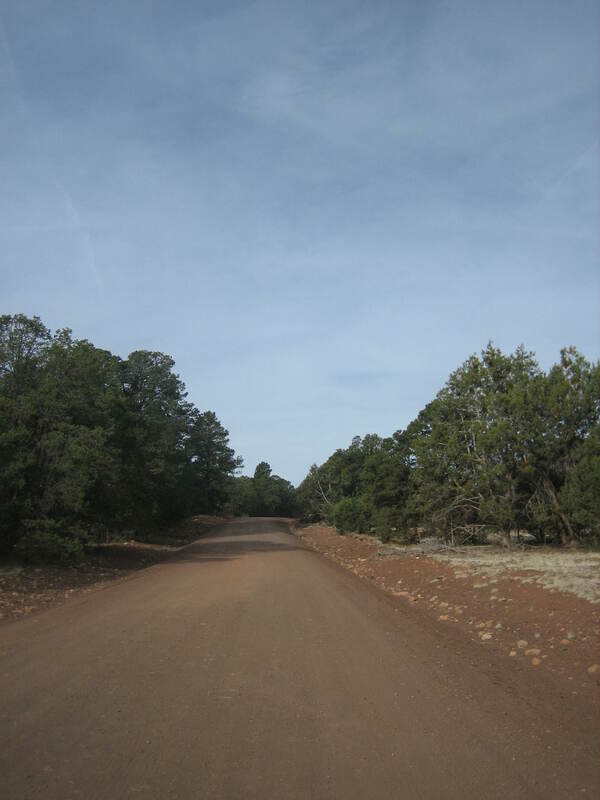 We turned off of the main road (Walnut Canyon Road) onto a well-maintained dirt road, which I believe is the road Google calls Oakmont Drive and says becomes Cosnino Road. This well-maintained dirt road had no signs, but we suspected we were in the right place because we could see RVs parked among the trees. 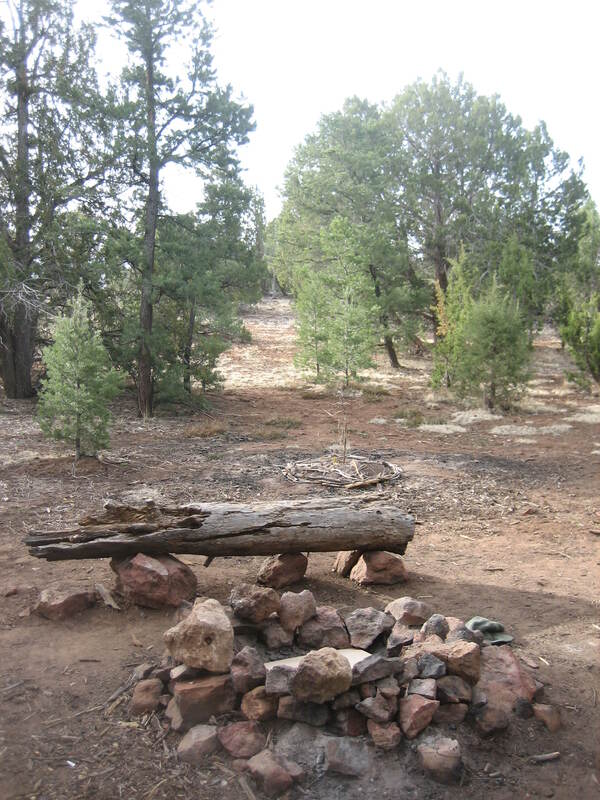 We hadn’t gone far down the dirt road before we saw a flat spot with evidence of previous camping (a fire ring made from stones, a log fashioned into a bench). We decided that site was good enough for our overnight, and I pulled the van in between the trees. While we were preparing and eating dinner and later while we were getting ready for bed, something mildly strange occurred. At differnt times, a couple of different pickup trucks drove like bats-out-of-hell on the well-maintained dirt road past our camp. The trucks weren’t gone long; shortly they were driving fast in the opposite direction, ostensibly back to their camps. It was as if the drivers had gone to the end of the road, then turned right around and come back. Where did they go? Why did they come back so soon? What was the huge rush? Other than these strange drive-bys, the camping area was very peaceful. We heard no evidence of partying–no loud voices, no loud music. Campers before us made a fire ring from stones and fashioned a bench from a log. I sat on that bench to eat my dinner. The Lady discovered this mountain view. The next morning The Lady went for a short run and came back to tell me she’d found a mountain view and other campsites. She said she’d show them to me, so I went on a brisk walk with her. problem getting to the sites wasn’t the road’s climb so much as the road’s poor condition. I was glad I hadn’t tried to take my van up the rutted and rocky dirt road. The campsites up top (evident because of stone fire rings) were nicely tucked into the trees and deserted, which surprised me. Sure, it was early April, not prime camping season, but I thought someone would have camped up there on a Friday night. However, it seemed we’d had that entire part of the boondocking area to ourselves. 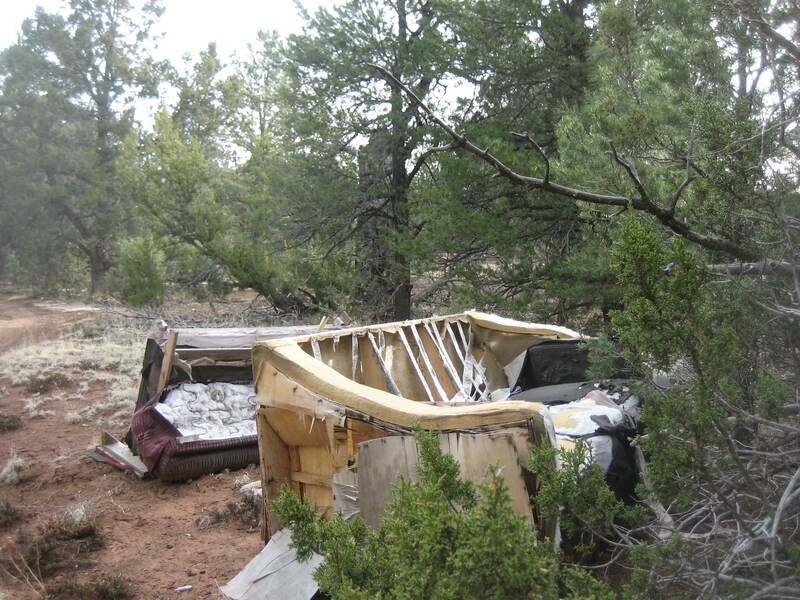 Whoever left these couches on public land left a pretty big trace! skeptically. I don’t think so. I think the sofas were hauled onto public land specifically for dumping! What a travesty! Overall, The Lady and I were pleased with our free camping. I would absolutely stay in this boondocking area again.